Happy Friday! Here is today's card!! I created this shape card in the Silhouette Studio. The owl and branch are also from the Silhouette Studio. 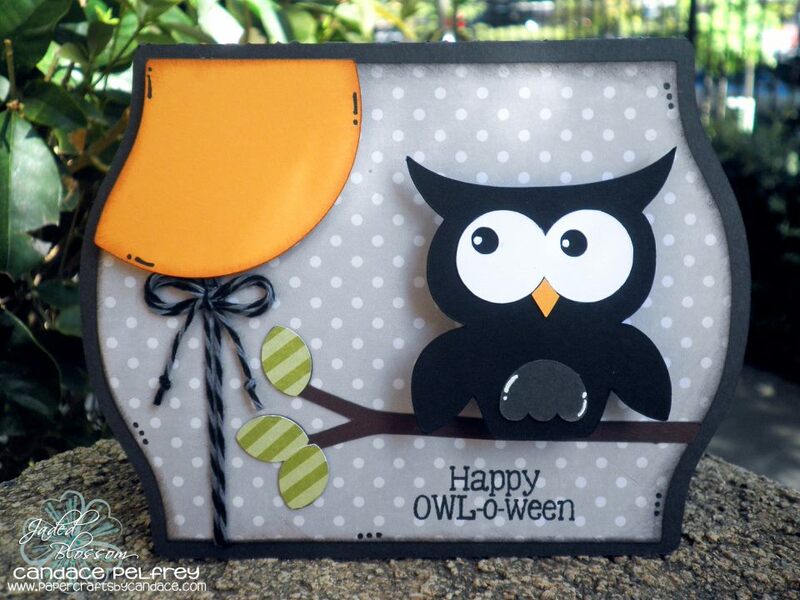 The sentiment is from Jaded Blossom's "Happy OWL-o-ween"
The twine is Gray Licorice from Trendy Twine. And this cute owl... is on an Action Wobble!! So I am entering this in this weeks challenge "Lets Polka". The challenge rules is that you must use an Action Wobble and you must have polka dots somewhere on your project. I used Echo Park "Dots and Stripes" paper for my background. I am also entering this in to the Cameo Creations Challenge "Anything Goes"
Thanks so much for checking out todays project! Woah...this is so very cute! love everything about it, that owl is just adorable! This is so cute. I sure hope that I can get the Cameo in the near future. The more I see the more I want it. Love this card! So cute!!! Adorable card. That owl is so cute. I love your adorable owl card. Love the twine! Great job! Thanks for sharing! This card really pops. Love the colors and large owl eyes!! This is such a nicely done card! Thanks for sharing it! I was so excited when I saw this card on facebook because it's so cute. Then when I went to your blog I see that it's made on a silhouette. I don't have one of those. I have a cricut expression and love it. Still love your card though. Would you send me one? Love your card! such a cute owl! Thanks for joining us at Cameo Creations! Love this card Candace!!! It is just tooooo cute!!! The owl is perfect!! Thanks for joining us over at Cameo Creations! Adorable!!! love the little hoot! Thank you for joining the Cameo Creations Challenge.